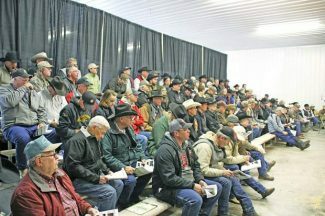 The seats were full for the Krebs Ranch 35th Anniversary sale. Kolton Hamilton, Belvin Angus, Alberta Canada partnered up with Ring Creek Farms also from Alberta, Canada on a top Krebs Ranch herd sire prospect. On Mar. 31, 1980 Krebs Ranch held one of the first production sales in the panhandle of Nebraska at the ranch location instead of in town at the local auction market. On Feb. 19, 2015 they celebrated their 35th Anniversary sale held at that same location on the ranch near Gordon, Nebraska. In those 35 years of breeding and selling bulls, Eldon & Louisa Krebs and family have strived to produce the best cattle possible for the times. The walls of the office at the sale barn are adorned with show trophies from the most prestigious cattle shows in the nation. Including most recently, the 2015 National Western Stock show award for the Grand Champion Pen of Three and Reserve Champion Carload of Angus bulls. 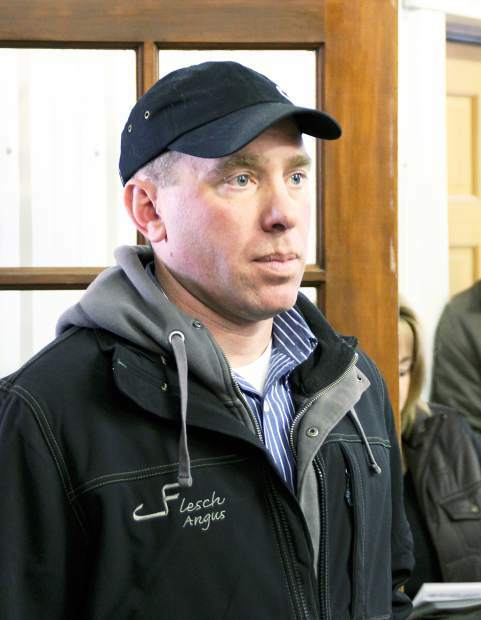 But most importantly, these cattle will perform where it really counts, in the pasture, in the sale ring and in the feedlot. 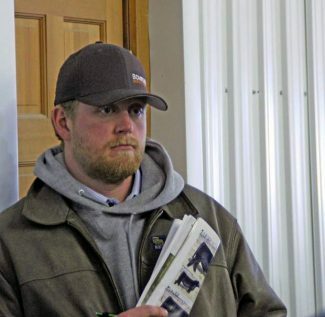 This sale was loaded with excellent bulls from start to finish, with the Denver pen and carload bulls garnering lots of added excitement. Topping the sale were two members of the Reserve Champion Carload bulls from this years National Western Stock Show. Lot 51, KR Identity 4267 is a 3/3/14 son of Koupals B & B Identity with epds of BW 2.7 WW 68 YW 121 Milk 31. This bull had a 109 weaning ratio, 111 yearling ratio. This powerhouse herd bull prospect sold to Twin Mills Ranch, Ansley, Nebraska for $125,000. Twin Mills Ranch also stepped up and purchased lot 44, KR Joe Canada 4287, a 2/18/13 son of K Bar D Joe Canada 18Y for $120,000. Another powerful herd sire prospect with epds of BW 1.9 WW 61 YW 107 Milk 29. This bull had a weaning ratio of 107 and yearling ratio of 112. Selling at $40,000 was lot 35, KR Cash 4003, a 1/17/14 son of Barstow Cash with epds of BW 1.1 WW 57 YW 107 Milk 28. This bull was the leadoff carload bull and sold to Belvin Angus and Ring Creek Farms, Alberta Canada. Flesch Angus, Shelby, MT bid $40,000 to own lot 40, KR Cash 4019, a 1/22/14 son of Barstow Cash with epds of BW 1.7 WW 63 YW 115 Milk 30. This bull was also a member of the Reserve carload. Selling way down the sale order at lot 161 was KR Cash CI 4600, a 2/6/14 son of Barstow Cash with epds of BW 1.1 WW 57 YW 107 Milk 28. Dave Lensegrav, Meadow, SD bid $32,500 to own him. Lot 39, KR Black Jack 4043, a 1/20/14 son of CFCC Black Jack 001 with epds of BW 2.8 WW 55 YW 96 Milk 18 sold to 74-51 Cattle Co., Oklahoma City, OK for $30,000. This bull was also a member of the reserve carload.